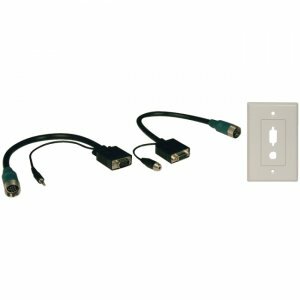 Easy Pull Connector Kit includes: HD15 Male w/stereo 3.5mm plug - 1 ft. pigtail, HD15 Female w/stereo 3.5mm socket - 1 ft. pigtail, and mounting wall plate. Completes your Easy Pull trunk run with a finished appearance. Video support up to 1600 x 1200. Use with either PVC or Plenum trunk cables. Tripp Lite Lifetime warranty.